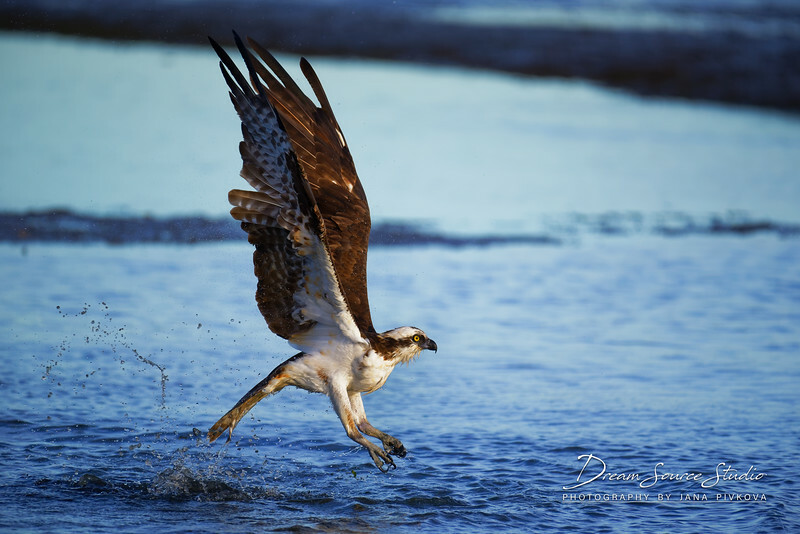 Bird & Wildlife Photography - Dream Source Studio | Photography by J.P.
Bird and wildlife photography is fun, but maybe you've noticed that it can also be quite challenging. Birds in flight are one of the most difficult subjects to shoot. They're fast, their movement can be hard to predict, they're usually camouflaged & far in the distance, and sometimes also very small. How do you make sure you get great results? Do expensive lenses and latest camera bodies guarantee success? Newer technology certainly makes many aspects of photography a little easier, but it doesn't guarantee anything. The photographer is a much more integral part of the equation. Whether it's in your back yard, a nearby lake, wetlands or desert, you've probably had an encounter with a wild animal and wished you had been ready with your camera in-hand to get a picture. Just like people, most wildlife form daily habits. Your job is to figure out what they are, so that you leave as little to chance as possible. Wild animals are usually most active in the early morning and toward sunset as they hunt for food. Low tide? Perfect opportunity to see lots of birds wading through the shallow water looking for food. Too hot for you at noon? Probably too hot for wildlife as well. They may be hiding in the shade. Depending on time of year, they might be more active than normal during mating, breeding & nesting season. Learn as much as you can about your local wildlife. Not only will it improve your chances of a wildlife encounter, you'll also know when and what to look out for. Although top-of-the-line equipment will help improve your chances of getting a high quality capture (if you know what you're doing), it can't make up for lack of knowledge, timing and skill. I've lost count of the number of times I've seen photographers in the field with thousands of dollars in gear, only to then see them produce results that could have been captured with a far less expensive set-up. How is it possible that a photographer with a $5,000 set-up is being outdone by a photographer with a $1,500 set-up? There could be many reasons, but one of them is the fact that they don't know how to use it properly. The wrong settings and not enough practice wielding the camera & lens could cause a blurry, overexposed and noisy shot. Some will go straight into blaming their equipment, but rest assured that most times it comes down to user error, not the gear. Generally speaking, we do not have a lot of time to get the perfect shot. Wild birds don't usually hang out in the same spot for minutes at a time, waiting for you to get the perfect photo before they fly off. You might have a few seconds to spot the animal, frame your subject and fire off a few shots before it flies off out of sight. You have to be ready and you have to have the right settings in place to freeze the action in perfect clarity. Many times the key to success is patience. Walking around and hoping to find something along the way is a decent strategy (that I myself sometimes employ), but if you get to know where the animals like to hang out, it's probably a good idea to dress in muted colors (something that will help you blend into the environment), find a comfortable spot, sit down somewhere less conspicuous, wait, and be ready when a bird or animal shows up. Make sure to put your phone on vibrate, try to move as little as possible and be patient. There will be days when you'll have very little luck, but that's O.K. You got some fresh air, right? Not every outing will be perfect, so be ready to go home empty-handed. Many of us living in cities have to venture far outside our neighborhoods (sometimes hiking or traveling miles) to get to a spot with abundant wildlife. Not all of us are lucky enough to have a large back yard or wooded area nearby, but if you're one of the lucky ones, you can use it to your advantage. There are ways you can lure wildlife to you without having to set foot off your property. Hanging a conventional bird feeder in your yard is one way to go about it, but in my opinion you can do better than that. Most wildlife photographers want to capture the animals in their natural environment and a human-built bird feeder doesn't add to the photo, it takes something away. Building your own natural-looking bird feeder and setting it against a natural-looking back drop is far more appealing. Taking a medium-sized bark-covered log (or thick branch) laying it down on its side, cutting a small hole into it and filling it with bird seed, could attract hungry birds. Make sure to place the feeding hole out of sight, so that it is not visible in your photos. Building a comfortable hide in your yard to go with your new natural-looking feeder could get you close to the action without having to use a super-telephoto lens, or spooking the bird away. Keep in mind that it may take some time for the local birds to find and get used to the feeder, so be patient. 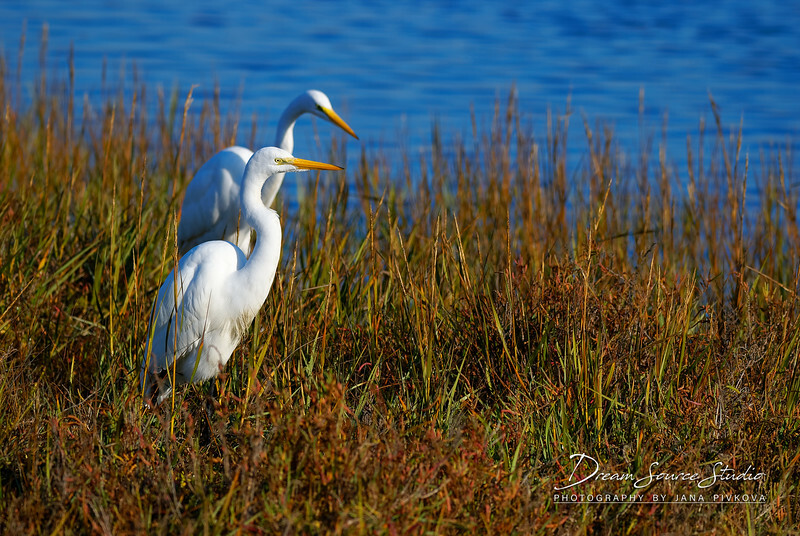 Talking to and getting to know local wildlife photographers can be a great way to figure out where wildlife hangs out. It's probably not a good idea to approach them while they're trying to get their shot. Even if they're simply sitting down somewhere and staring into space, they probably don't want to be disturbed as they try to keep their eyes on the surrounding wildlife. Loud conversations are distracting and may scare wildlife away. So when's a good time to talk? You may want to consider joining a local photography club or photography forum and attend a meet-up. It can be fun (and safer) to go shooting as a group, even if it's just one or two other people going with you. Unless you have a mutual understanding with each other, try to keep the conversation and fast, sudden & loud movements to a minimum while in the field. It will improve your chances of seeing something worth shooting, and nobody can blame you when they miss their opportunity. Some wildlife photographers may not be all too happy to share their locations with you, because they don't want more people to disturb the area, or they want to keep the good photo opportunities to themselves. Sometimes you'll just have to find your own spots. Finally, be respectful of the environment. Try to keep your human 'foot print' as small as possible, wherever you go. Light is one of the most important elements in photography and you want to use it to your advantage. Pay attention to the light, because it is magical and can make or break your photos. Individual preferences may vary, but personally I like to shoot when the sun is lower in the sky, such as during sunrise or late afternoon to sunset. Shadows are soft, colors seem more vibrant when bathed in golden sunlight, and highlights are under control. These are also the times of day when wildlife is most active. When the sun is positioned overhead, the shadows are harsh, highlights are too bright and colors washed out. Usually this is the hottest part of the day. It may work for some, it might even make for great black & white photography, but I like to avoid this time of day for wildlife. Also, always make sure that the light works for you, not against you. Unless you're going for a dark silhouette, you want the sun at your back with your subject in the light. A good photograph, to me, needs to capture three things; the moment, the light and good composition. Instead of centering my subjects in the middle of the frame, I like to use the rule of thirds. This means that my subjects are usually framed just off-center either to the right, or to the left. How do I decide where my subject ends up? If the bird's eyes look to the left, I will position it to the right. If the bird's eyes look to the right, I will position it to the left. If the bird is looking down, I might position it either on the left or the right side, placed slightly higher in the frame than normal. If I don't get it right in-camera, I will try to re-compose the image later in post to adjust it to my liking. Sometimes there's no room to crop and I have to live with it. Unless you're focusing on specific details such as the eyes, the head, etc., try to include the whole subject. If you have to zoom out or back-up to fit the whole animal into the frame, do so. If you want to include some of it's surroundings to tell a story, do so. Is the bird looking down at the water and hunting for a fish that you can't see? Maybe you want to imagine where that fish might be in the frame and include it in the shot, even if you can't see it. A lot of good photography is about story-telling. Choosing your point of view carefully is an important part of composition. Instead of always shooting from your natural height and pointing the camera down at your subject or pointing it up, try to squat down. Try to get on your knees, or get on higher ground if you have to. Don't be afraid to get on eye-level with your subject! If that means laying down by the lake in the mud, try it. You may find that sacrificing your clothes may get you some spectacular shots! Bring a waterproof mat with you, or wear water-resistant clothing. Just be careful not to dunk your camera and lens in a puddle. Some of these things are weather resistant, not water-proof! If you want to learn more about composition, it helps to study the photos of other bird & wildlife photographers. Ask yourself why you like some photos and not others. Identify the elements that draw you in and try to recreate them in your own work. Shooting only RAW is like shooting negative film, and shooting only JPEG is like keeping nothing but the final paper prints in storage. Though I could shoot in both RAW and JPEG, I don't. JPEGs would only take up space on my cards and potentially slow down the camera while taking multiple bursts. I like to shoot RAW at the highest quality available. I want each image to contain as much data as possible, so that I can later lift shadows or pull back highlights during post as needed. Pulling shadows can create excessive noise or loss of detail. Shooting RAW keeps that to a minimum. If buffer is an issue, (which it very well may be with some cameras), shooting at 12bit RAW to free up space is also acceptable. In most cases it would be hard to distinguish between 12bit and 14bit RAW files. The minimal loss in image quality (if any) would be worth the shots that might have never happened had the camera run out of buffer. JPEGs contain about 8 bits of data compared to RAW, which can hold up to 14 bits of information. Some prefer to shoot JPEG because they are satisfied with them, or they don't have the time for, or do not enjoy post processing. I am not one of those people. While I agree that one should get things right in-camera from the get-go, I am not a perfect photographer and am willing to take my time with each image to ensure the highest possible quality. Shooting RAW also means that as post-processing software improves over the years (or as I learn new things about post-processing), I can go back to some of my older RAW files and do a better job with them! In manual mode I have full control over the shutter speed, aperture and ISO, if I choose. While Aperture priority is a great mode for when the light can vary from one shot to the next, the camera may select a shutter speed that is too slow to freeze action, prioritizing a low ISO when Auto ISO is turned on, and potentially ruining the shot. The only time I select Aperture priority is when I know my subject will remain still and can withstand slower shutter speeds. Shutter priority is another option, but I want to be able to control my f/stop, which is something that can vary from one shot to the next in Shutter priority mode. A variable f/stop can affect my depth of field and quality of bokeh. I don't want to leave that decision to the camera. Automated modes give the camera too much power. Generally the auto modes work very well for some situations, but in my opinion wildlife is not one of them. The camera is a machine and it does not know the difference between a bird flying past you at 20mph vs. a bird standing still. You have to be the judge of that and adjust the settings accordingly. If you plan to shoot fast-moving birds, a higher shutter speed will help you freeze the action. Sometimes even slower shutter speeds can freeze motion if you time it right, but you may end up with blurred wing tips for example. Why do I not use a shutter speed higher than 1/4000s? 1.) My Nikon D750 tops out at 1/4000s (this is the case for many other cameras as well), which is generally fast enough to freeze almost any moving animal. Most of my bird-in-flight images are taken at 1/2500s and I have no problem freezing the action. Usually diving terns are the only birds that require a shutter speed of 1/4000s or higher. 2.) Although my Nikon D500 tops out at 1/8000s, for darker subjects with this shutter speed, I would need to use higher ISO even in good light, which translates to more noise, which means some loss of details. I am happy keeping the shutter speed between 1/2500s and 1/4000s 98% of the time. Other photographers may not agree. 3.) Higher shutter speeds help reduce motion blur caused by shaky hands during shooting, especially if the lens or camera is not equipped with vibration reduction technology. If you own a high megapixel camera such as a Nikon D800 or Canon 5DS R, you're probably familiar with visible motion blur during pixel-peeping your files at 100%. Most people who post downsized images on the web will not be affected, but if you plan to crop deep into the image, it may become an issue at some point. If you're fortunate enough to own an f/2.8 telephoto and it's long enough to reach your subject, all power to you. You'll have a shallow depth of field, but also great subject separation. If you're close to your subject and want to get most of it in focus, shooting wide open at f/2.8 may not be a good idea. Using f/2.8 in low light can also be useful as it allows you to shoot at lower ISO while maintaining a high shutter speed. It will help keep the noise down in your images. If you're looking for more DOF (depth of field), you will need to stop down to anywhere from f/3.5 to f/8. How much DOF you will have at these apertures will depend on how close to, or how far you are from your subject. The closer you are, the less depth of field you will have. While many photographers are not afraid to stop all the way down to f/11, personally I feel that there will be too much loss of light, it will affect the speed of the camera's autofocus, and force me to use a higher ISO than necessary. I would also lose some subject separation from the background, creating busy out-of-focus areas. What aperture you select will also depend on the lens you are using. Each lens has a "sweet spot", meaning it is at its sharpest at a certain f/stop. You'll want to find out what that sweet spot is, and use it. I am not a fan of lenses that need to be stopped down to as far as f/6.3 or f/8 in order to produce sharp results, but sometimes we have no choice due to budget restrictions. Keep in mind that the more you need to stop your lens down, the less light will hit the sensor. This means you'll have to use a higher ISO to get proper exposure and your images will become more noisy. In other words, for the sake of low noise and high dynamic range, try to use as wide an aperture as you can while still maintaining good depth of field and sharpness. Not all cameras come equipped with Highlight-weighed metering. Nikon implemented this useful feature in the more recent camera bodies such as the D750, D810, D5, D500, D7500 and D850. Highlight-weighed metering measures the entire scene and exposes for highlights. This means it will expose for the brightest area in the frame, protecting it from overexposure. Although Nikon thought it would be most useful for stage photography with bright lights, this mode is perfect for white birds in bright sunlight, but also any sun-lit scene that you don't want overexposed. Highlight-weighed metering is not perfect all the time. Sometimes it can underexpose the scene. For that reason I might dial my exposure compensation to +0.3 to make up for a bit of underexposure, but usually I'll make the adjustments during post. Saving the highlights is more important to me than getting the correct exposure in-camera. You do not want to use this mode if your subject is back-lit, unless you're going for a dark silhouette. The camera will underexpose the scene quite a bit and you might not be able to save it in post. Back-lit subjects may be better-served with Spot metering. If your camera does not have Highlight-weighed metering, Matrix metering will work great as well. If you find that your camera tends to overexpose your subject in Matrix metering, you can protect the highlights by adjusting the exposure compensation to -0.3 or -0.7 in-camera. Some photographers use Spot metering for wildlife, but I personally do not like using it. It can work well for situations where you have time to compose your shot and place the AF point where it needs to be, but in hectic and unpredictable situations, some photographers are not going to be quick enough to react and produce proper exposure every time. A grazing elk at sunset compared to a duck suddenly flying out of the reeds at 30mph are two very different scenarios. It's challenging enough trying to stay cool, calm and collected as I struggle to find and track the duck in my viewfinder, let alone making sure my main AF point is exactly where it needs to be. Maybe not for some, but for me, Highlight-weighed metering is a safer bet than Spot metering. I suggest you try all the different metering options for yourself and see how you feel about each. Not all cameras have the Auto ISO feature, but if yours does, try it out. Most recent camera models will do a great job selecting the proper ISO to produce the ideal exposure. If your camera does not have Auto ISO and you're not sure what ISO is appropriate for the scene, there are two ways to figure out proper exposure. 1.) You can use Aperture Priority mode to see what ISO the camera selects automatically. 2.) You can check the histogram on the back of your camera to see whether the image is over or underexposed. While camera auto modes have gotten very good, they are not always perfect. Getting in the habit of checking the histogram is always a good idea. If the histogram leans too far to the left, the image is underexposed. If the histogram leans too far to the right, the image is overexposed. There is no such thing as a perfect histogram, but generally you want to keep it balanced somewhere toward the middle. Highlights can be difficult to recover in post even when shooting RAW, so keep that in mind. Cameras have many AF modes, but for wildlife and action, AF-C on Nikons and AI-Servo on Canons is the way to go. These modes allow you to track your subject continuously. If you keep your shutter half-pressed or if you use the AF-ON button and keep it pressed, the camera will keep re-focusing as the subject moves. Depending on whether I'm using the D750 which has AF-C 9 point, or the D500, which has AF-C D25, I like to use as few AF points as possible. This prevents the camera from getting confused by a busy background behind my subject. AF-C Single point is great and most precise for slower-moving subjects where it's not so difficult to keep a single point on the subject at all times, but if you're trying to track a fast-moving bird with a big lens, it's easier to use more AF points to keep it in focus. AF-S (or AI Focus on Canons) would not be appropriate for a moving subject. These modes do not re-focus on the subject as it moves. Nikon cameras have an item in their autofocus menu that allows you to select how the camera reacts when you press the shutter button. You can tell the camera to fire the shutter even if the subject is not in focus (shutter priority), or you can tell the camera to fire the shutter only when the subject is in focus (focus priority). I have my cameras set to shutter priority, because I don't want the camera to lock up during a burst simply because it doesn't believe my subject is in focus. Sometimes a slightly out-of-focus image is better than no image at all. It is up to you to decide how you like your shutter to behave. Nikons have an additional autofocus option that allows you to select how long you want the camera to track a specific subject before it re-focuses on something else. My tracking option on my D750 is set to "3", and my D500 set to "2". This means that the camera will track the locked-on subject for about 2 to 3 seconds before it re-focuses on something else, even if my AF points stray from the subject, or even if a different subject blocks my selected subject during tracking. This is useful if you're tracking a bird that is flying behind trees, for example, because the camera will not re-focus on the tree even if your AF points move across it. Selecting option "1" will cause the camera to re-focus on a different subject almost immediately once the AF point is no longer touching the selected subject. This option is useful if you want to be able to re-focus very quickly between different subjects. The Nikon D500, D5 and D850 have a new menu item which allows you to set the predictability of a subjects' movements. The options are between Erratic, Steady, or in-between. 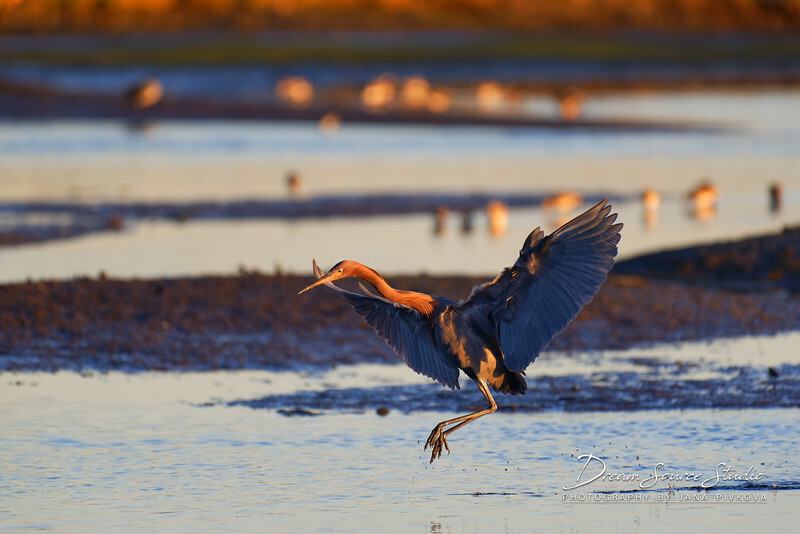 If you're shooting a subject who's movement or flight path is predicable, selecting "Steady" will yield best results. If you're shooting a subject who's movement is unpredictable, you may select "Erratic". Some cameras have a dedicated "AF-ON" button on the back next to the viewfinder, and some cameras will allow you to re-program the AE-L/AF-L button to function as an "AF-ON" button. While all cameras can both focus and take the shot with the shutter button, it is possible to de-couple the shutter button from the focusing function and assign the focusing function to the "AF-ON" or "AE-L/AF-L" button. How is this useful? AF-ON is like having AF-C and AF-S in one button. You hold it down with your thumb to continuously track your subject and press the shutter button whenever you're ready, or you briefly touch the AF-ON button to acquire focus on a still subject and take your thumb off to make it behave like AF-S.
- VR - Turned OFF with higher shutter speeds while tracking fast-moving subjects. Having VR (or IS on Canon) is extremely useful when needing to use slow shutter speeds while hand-holding, but it can actually work against you when used with high shutter speeds, or when used on a tripod. VR can cause un-sharp or slightly blurry photos when combined with fast shutter speeds, so turn it off if you're shooting a fast-moving subject and your shutter speed is faster than 1/1000s. If you must use VR and your lens is equipped with "Sports" VR, use that instead of normal VR. Many believe they need very expensive cameras and lenses to get great results. It's true that the latest technology can make things easier for us, but it doesn't guarantee success. 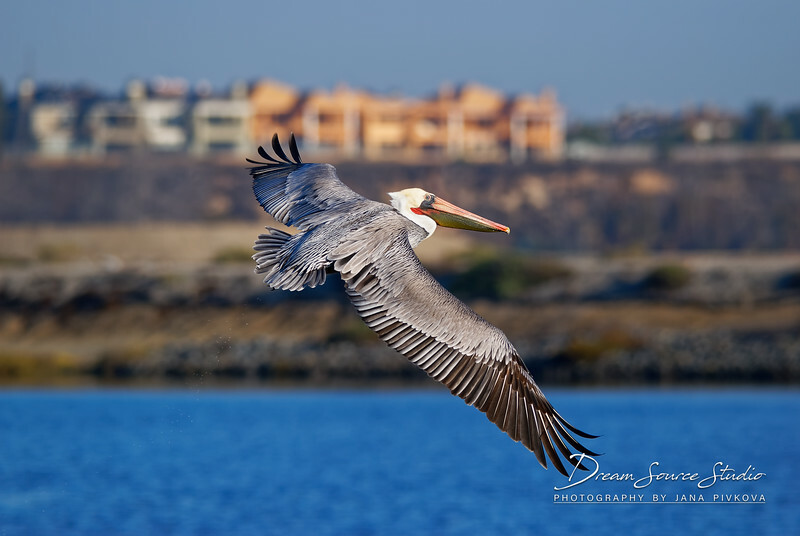 The above image of a brown pelican flying over the Bolsa Chica wetlands was taken with a Nikon D40X, a tiny 10.2 megapixel DSLR that is now over a decade old, has 3 AF points, and does 3 frames per second at most. It tops out at 8.14bit RAW using ISO 100, compared to a D750 which measures 11.49 at ISO 80 (according to Bill Claff's dynamic range measurements). You can find one of these beauties for about $100, used. The lens is a Nikkor 300mm f/4D IF-ED AF-S, which I bought used for around $800 in great condition. A newer version of this lens is now available, but it is also twice as expensive and not any sharper. The reason I was able to produce a quality image with the little Nikon D40X, is because I used the correct settings and I had a quality lens attached to it. I was also familiar with my subject. By observing the pelican's behavior and body language for some time, I was able to anticipate its next move and was ready to shoot when the time was right. I got some funny looks from the other photographers when they saw my camera, but that's O.K. I came home with plenty of keepers. - How Important is a Quality Lens? Very important. A good lens is more important than the camera body you plan to purchase. Good glass can last you many years and will not depreciate in value the same way camera bodies do. Generally-speaking, primes are some of the sharpest lenses available, but long telephoto primes can be pricey, not to mention heavy and hard to wield free-hand. If you have a large budget and don't mind carrying around large lenses, they are an excellent choice and will help you get top notch results as far as sharpness, speed, contrast and bokeh are concerned. Personally I like having the freedom to move the camera and lens in any direction I want, so I prefer going with something smaller and lighter. Other photographers don't mind using a monopod or tripod with a large, heavy lens. They choose to stay parked in one spot for longer periods of time, waiting for animals to show up. Your shooting style is up to you. - How to Choose Your Telephoto Range. This will depend on your shooting style, but most wildlife photographers who do not have access to hides, or are unable to get closer to their subjects without spooking them, will need reach and will not want to choose anything shorter than 300mm. Even 300mm is usually too short for most small birds, and many photographers will attach a teleconverter to their shorter primes to extend their reach. Teleconverters are a cheaper way to extend your lens's reach. Nikon sells 1.4x, 1.7x and 2.0x teleconverters. While the 2.0x TC will get you closer to your subject compared to a 1.4x TC, it will also degrade the image quality to a larger degree. The more magnification it has, the slower the lens will become as the aperture narrows and amount of light hitting your camera's sensor is decreased. A Nikon 300mm + 1.4 teleconverter paired with a Nikon crop sensor camera will become a full frame equivalent of 630mm f/5.6 lens. (300mm x 1.4TC = 420mm. 420mm x 1.5 Nikon crop factor = 630mm). Teleconverters are great when paired with fast, sharp primes, but when paired with sub-par lenses, they will degrade image quality by a noticeable margin. They also cause you to lose a full stop or more of light, so attaching them to lenses with slower apertures will not yield the best results. For example, thanks to its wider aperture, a Nikon AF-S NIKKOR 300mm f/2.8G ED VR II is going to to handle a 2.0x TC with far less IQ loss than a Nikon AF-S NIKKOR 300mm f/4E PF ED VR. Personally I would not recommend using a 2.0x TC on an f/4 lens, or slower, but others may disagree. - Tight Budget? No Problem. If you bought what you thought was a quality lens but you can't seem to produce sharp results with it (assuming you have ruled out any possibility of user error), it's possible that you may need to use the in-camera AF fine tune function to tune it to your camera body. It is perfectly normal for some lenses to need a small adjustment. When I buy a lens, I always check for front or back focus, and AF fine tune it before taking it into the field to prevent missed focus. If your lens is back-focusing (which means it grabs focus behind your subject), or front-focusing (which means it grabs focus in front of your subject), you can use the positive and negative values in AF fine tune to adjust the lens and ensure you nail focus every time. If you feel you've made it worse, the adjustment is fully reversible. Some camera bodies do not have the AF fine tune option and may not need it. If your in-camera AF fine tune function can't seem to correct the issue, some third-party lens manufacturers such as Tamron and Sigma offer an AF fine tune USB doc that will allow you to make adjustments to their lenses at different focal lengths. Having lots of reach is great for most bird and wildlife photographers, but atmospheric haze and heat could prove to be a real pain. You could have the best camera and all the reach in the world, but if your subject is far from you and haze or heat is present in the atmosphere, your chances of grabbing a sharp shot goes out the window. Heat distorts the air, which may confuse the camera's AF, or simply get in the way of your glass and the subject. Shooting far-away birds in flight on a hot, sunny day may result in many out-of-focus shots with low details, even if all your settings are spot-on. Getting closer to your subject and filling the frame is the only way to produce better results in this scenario. - Choosing the Right Camera for You. If you wish to purchase or upgrade to a new camera, there are a few things to consider, and your budget is one of those things. How much are you able to spend on both a quality lens and camera? Do you have enough in your budget for both? If you have a specific lens and camera in mind and you don't want to compromise, it's probably better to keep saving until you are able to buy both without straining your wallet. This is where patience and willpower come in handy. Budgeting for a lesser lens so that you can afford to buy the camera body you want is not exactly a wise decision, unless you're not as picky about IQ and sharpness of your images as I am about mine. As I mentioned earlier, it doesn't matter what camera you use, your results will mostly depend on the lens and your skills as a photographer. - Autofocus - Number of AF points, number of "cross-type" points, viewfinder coverage, low light sensitivity. It's not all about how many AF points there are, but also about how fast & accurate they are. Read reviews and watch comparison videos, if available. Go to your local camera store and try it out, if possible! - AF motor - Does it have a built-in AF motor, or do you need to purchase AF-S lenses for the autofocus to function with some older non AF-S lenses? - Frames per second (FPS) - Number of shots that can be taken within one second. The more FPS it has, the better your chances are of capturing different poses or wing positions of birds during flight. It is not vital to have 7 to 10 FPS, but it does help sometimes to catch a special moment. - Buffer - How many shots per second can be taken in RAW before the camera slows down? How long does the camera keep shooting before the buffer fills and slows down? How long does it take for the buffer to clear? It can be frustrating to run out of buffer before the subject leaves the frame. Having a deeper buffer means you can keep shooting until the subject is out of sight. If the buffer takes too long to clear, the camera may not allow you to take any further shots until it has cleared the buffer. You might miss out on a photo opportunity while it is clearing. Some cameras will allow you to keep shooting, but at a slower frames-per-second rate than normal. - Sensor size - Will you go full frame (FX) or APS-C (DX)? Do you have a large budget for a long super-telephoto lens that will make up for lesser reach with an FX body? Do you plan on getting closer to your subjects instead of having to rely on longer reach? Do you want to have both a long telephoto lens and get the extra reach with an APS-C sensor? This is up to you. - Resolution - How many megapixels? Will you be sharing the images on the web only? Do you plan to print larger than 13" x 20"? Do you like to crop your images? Will you be able to crop into the image if needed, without losing too much resolution? - Dynamic range - How well does the sensor retain shadow and highlight information as the ISO climbs higher? Do you enjoy extreme post-processing? Do you plan to shoot in poor light? - High ISO performance - How does it perform at higher ISO compared to other cameras? Will you lose too much detail to noise if you're shooting in lower light? - Battery life - How many shots can you take before the battery needs to be charged? Is it compatible with a battery grip that can extend battery life? - Weather Sealing - Do you like to shoot in rainy or foggy weather? Will the camera and lens withstand a bit of mist or rain without breaking down? - Ergonomics - Will the camera feel good in your hands for long periods of time? Is the menu easy to understand and navigate? Another way to extend your reach (besides teleconverters) is to purchase a crop sensor (APS-C) camera. Due to its smaller sensor size, it gives a magnifying effect compared to full frame (FX) cameras, making it seem as though you gain more reach by 1.5x or 1.6x. Nikon's APS-C has a crop factor of 1.5x. Canon's APS-C has a crop factor of 1.6x. For example, a 300mm lens on an FX body is 300mm. A 300mm lens on a Nikon APS-C body is 300mm x 1.5x = 420mm full frame equivalent. You get an extra 120mm magnification with your 300mm lens when attached to an APS-C body. a.) More reach with your lenses and therefore more pixels on your subject. b.) More depth of field at equivalent apertures. "Crop sensor" cameras usually cost less than same-generation full frame cameras, but they also come with a caveat. Due to the smaller sensor size, they are less capable of gathering light compared to full frame. The more light a sensor is able to gather, the less noise it will produce in your final images. In good light this difference is minimal, but when the light is lowered, or when needing to use narrow apertures while maintaining fast shutter speeds, using a high ISO will cause the appearance of noise and some loss of fine details. Many photographers don't mind the slight increase in noise, especially if they shoot in good light. Others may be pickier about their results, especially if they like to crop deep into the images, because it may reveal some flaws during pixel-peeping. Full frame cameras have long been the choice of most professional photographers. Due to their bigger sensors and lesser pixel density, full frame cameras are able to gather more light and therefore produce less noise at higher ISO. They also have more dynamic range, which is important especially during post processing, when pushing shadows or pulling back highlights. Bigger sensors also produce smoother bokeh (out of focus areas) at equivalent f/stops compared to APS-C, they are better at isolating the subject from a busy background, and the transitions between gradients (most noticeable in bokeh and cloudless sunset skies, for example) are smoother, though converting the images from 14bit RAW to 8bit JPEG may degrade them. a.) Less noise at higher ISO. d.) Wider angle of view. - Useful in wildlife photography if you need to zoom out, or capture more of the background. a.) Generally more expensive than their APS-C counterparts. b.) 1.5x (for Nikon), or 1.6x (for Canon) less magnification with telephoto lenses. c.) They require longer, more expensive lenses to compensate for shorter reach. Bird and wildlife photography is a wonderful hobby. It gets you out of the house and into fresh air. It makes you appreciate your surroundings, makes you more aware of your environment and helps you learn new things about the wildlife around you. It may even help you make new friends! Although new toys are fun to play with (I love new toys!!! ), try not to get too caught up in G.A.S. (gear acquisition syndrome). It's too easy to become envious of other photographers with BIGGER lenses and BIGGER camera bodies while out and about in the field, especially when it may seem like some cast judgement on your skills based on your gear. Expensive gear is not usually an accurate reflection of how good you are as a photographer. You may end up outspending your skills, unable to take advantage of the small advances that newer technology might have to offer. Unless you have an unlimited budget, spend some time practicing with your existing, or a less costly set-up before you invest in expensive camera bodies. Trade up only when you feel like your camera is holding you back. Ask yourself what it is that you are unable to accomplish with your existing camera and be honest with yourself. Is it the camera, or your skills that are holding you back? The release of a better camera is always around the corner, which also means that there will be amazing deals on great existing gear! Sensor and even AF technology has not improved by any drastic measure in a few years, so rest assured that even less recently released cameras are still incredible performers in the right hands. Now go put on your hiking shoes, grab your camera, bottle of water and get out there & shoot!